Inez McPadden, Beagh, Dromahair, Co Leitrim. Jim Connolly, Drumlea, Newbarn, Kilsallaghan, Co Dublin. Drumreilly GAA Club, Co Leitrim. Maura McCormack, C/O Crowes Vets, Carrick on Shannon, Co Leitrim. 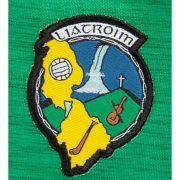 Carrigallen GAA Club, Co Leitrim. Pauline & Gordon Ryan, 12 Roemore Village, Breaffy, Co Mayo. Ballinamore Seán OHeslins GAA Club, Co Leitrim. Sheila & Eugene Fowley, Corraghaun, Leckaun, Co Leitrim. Special thanks to TP and Eileen Cox who hosted the draw, our valued sponsors, our many ticket sellers and of course the Leitrim Supporters who once again came up trumps in supporting our annual fundraiser.